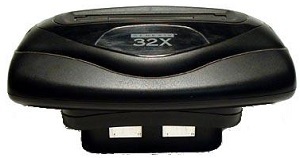 The 32x has the same video output port as the Genesis 2, 3 and CDX. 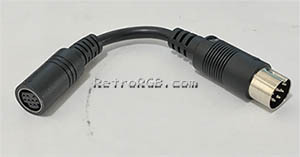 To get RGB from it, simply use the same RGB cable you’d use with a Genesis 2, as described in the Genesis RGB Cables section. 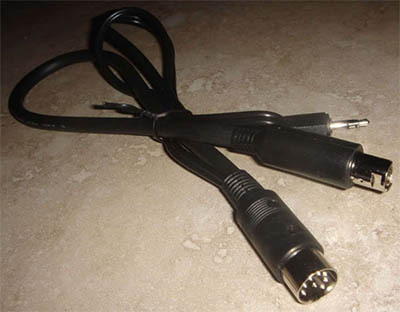 Alternatively, you can just make or buy one cable that directly connects the Genesis 1 to the 32x (although if you make your own, do not connect the 5v pin!). 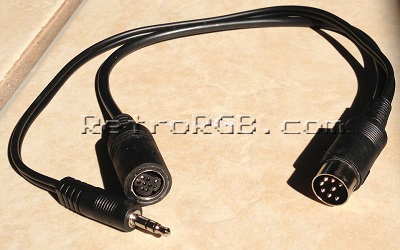 If you use one of these cables, you’ll have to buy a second RGB cable for when you’re only using the Genesis without the 32x (SMS games and Virtua Racing don’t work with the 32x plugged in). 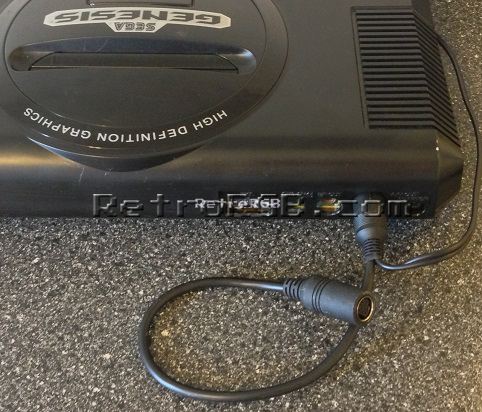 Also, the audio cable attached to it allows you to route stereo sound through the RGB cable (and 32x). This will work perfect with both the front headphone audio output, as well as the rear, should you choose to perform the Model 1 Stereo Audio Mod. – If the patch doesn’t connect to the 32x (like the ones with the female Gen 2 port), connect all pins. – Any 32x patch cable that does connect to the 32x must not have the 5v pin wired! If you look at the schematics of the 32X, it looks like they purposely kept the Genesis +5V from the cartridge slot and the internally generated +5V separate. The most noticeable reason it seems is to add power sequencing to the design. The 32X +5V is unable to turn on unless the Genesis +5V is present, which is what you want. 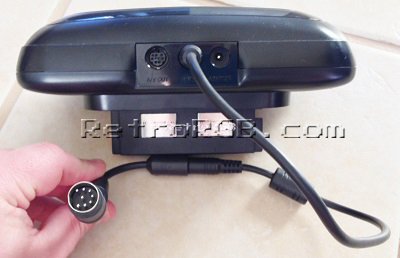 “The original 32x model number is MK-84000 and it came with a bus terminator for the Sega CD connection. The bus terminator would ground the Sega CD connection (If you didn’t have a Sega CD) and keep the original 32x from crashing on some revisions of the Genesis 2. It’s my recommendation that if you have use anything other then a Genesis 1, just use the standard 32x patch cable (remember, no 5v connection on those!) 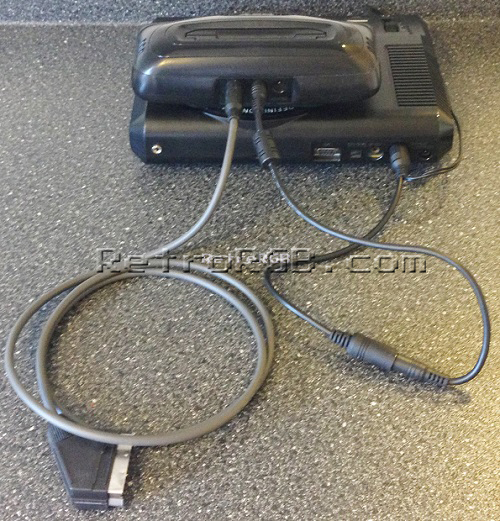 and a Genesis 2 RGB SCART cable. If you have a Genesis 1, you should use the M-F patch cable that essentially turns your Gen 1 output into a Gen 2, then use the above two mentioned cables. All links are at the top. I’m sorry if that was confusing, but blame Sega for making so many accessories for the Genesis without an easy way to connect them! If you’re using a Sega CD and are unsure about how the audio works in conjunction with the 32x, check out the Sega CD page for more info. If not, please head back to the main Genesis page. SEGA Genesis Bundle (Includes 32x, SEGA CD, 2x Controllers) - Used - Read Desc. Official Sega Genesis 32X System Only Works Great Fast Shipping! Sega 32x lot. Star Wars 32x and Cosmic Carnage. Tested. Cart only.